Criteria’s RikkiRoo Rarebeastie, out of Fever by Syd, April 23, 2013 litter. 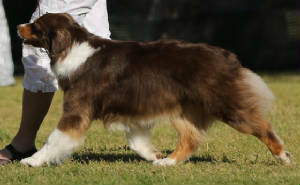 I was looking for an agility prospect and tried to find one in Aussie rescue, but had no luck. Just by chance, I stumbled upon the Criteria website and saw "Rosie." We go back many years with Terri, as she was active in agility when we first started in 1999, but we hadn’t seen her at a trial in some time. On the “available” page was "Rosie." She sounded just right: red, female, precocious and bold. We came to look at her and fell in love. Our only worry was that our male Aussie, Rave, might be very upset that we’d gotten a puppy. He has an auto-immune disease that can be affected by stress. This all happened in August. Segue’ to February, six months later, and Rikki (Rosie’s new name) is Rave’s constant sidekick. They are truly inseparable and she has made his life such a joy with her unceasing, untiring playfulness and wonderful personality. We know she has contributed to the better health he’s now enjoying as he’s so happy! Rikki has many outstanding qualities, but the one at the top of the list is her attitude. This girl always has a smile on her face. She’s a bundle of affection and devotion. Rikki is the ninth Aussie we’ve owned, and the smallest, but it’s as if several dog's worth of "Aussitude" is packed into this little creature. She has the personality of an Aussie, times a hundred, inside her compact package. She jumps higher, she runs faster, she turns quicker, she learns faster; then she turns her beautiful amber eyes on you and you can see this sage-like wisdom swirling around in them. Rikki is a very old soul, always evaluating a situation and clicking through the possibilities. She’s also SO mischievous! I affectionately call her a little snake. She will steal food, weasel her way into situations, and play keep-away to the point of exhaustion. We have done some obedience and agility foundation training with her, and she catches on instantly. What’s exciting is that she LOVES to learn. As soon as she realizes it’s class time, she wiggles (though in her case it’s a whole body vibration) with anticipation, trying to figure out as soon as she can, what she needs to do to please you, to get that much-desired cookie. In the spring, she’ll start more regular training. Right now, we’re letting her grow up and enjoy her childhood. Would we get another Criteria puppy? You BET! Our hopes are that Rikki takes her lightning speed (we call her an Inter-Continental Ballistic Aussie) to the agility course and becomes a star. We’ll also be herd testing her in the near future. She’s aces at herding cats, so sheep should be no problem! We’d love to hear about all her brothers and sisters in her litter. Surely, they’re all phenomenal, just like Rikki! Thank you, Terri, for allowing us to make Rikki a part of our family. "I had been looking for a new canine companion for some time - over 20 years! 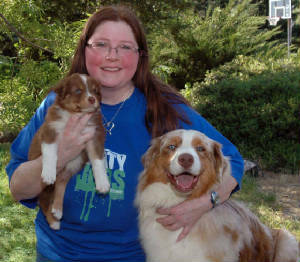 When I finally realized that it was an Aussie - personality that fit the bill, I was quite blessed to have come across Terri's website - Criteria Australian Shepherds. Terri from the get-go, was prompt with emails, answered (thoroughly) my endless questions and seemed to be as eager to meet me as I was to meet her and her dogs. 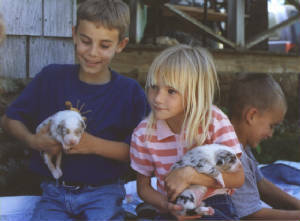 To get an opportunity to meet the parent-dogs in person and meet the breeder was a crucial part of deciding which dog would eventually be best for me. 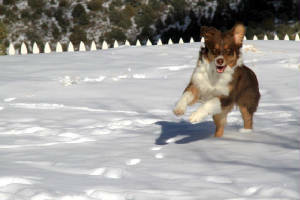 At the Dumont home, I first met "Summer" (dam) who greeted me with the best "Aussie grin" I've seen yet. She was so friendly and gentle. Then later, when I met "Syd" (sire) he was so bright-eyed and wiggling with excitement - very sweet and gentle. These were just great dogs! That speaks volumes for their breeders/owners, Terri Burkart-Swenson and Tamara Dumont for raising "Syd" and "Summer" (respectfully) in such loving homes. It goes without saying then that the puppies of these two dogs should have at least some of their fine qualities. Both Tamara and Terri were very open about everything, and allowed frequent, unhurried visitation of puppies. This was my very first opportunity buying a pet from a breeder and what a great introduction to this aspect of pet ownership. These Criteria puppies are not raised in kennels, but in a devoted and caring home with all the activity, socialization, noises and comforts only a family/home environment can provide. At first I thought I wanted only a blue merle female (!) but after researching Aussies in general, I realized that it was neither color nor gender that truly matter, but personality. This sentiment was echoed and encouraged by the knowledge and experience of both Terri and Tamara. Follow your heart, not your mind. His first week with me he is definitely a calm gentle boy - but gets busy with activities and fun just like any puppy, but quickly settles again. Perfect! I couldn't ask for a better companion. Already, he is quite the traveler, going back and forth from my home near the ocean to the East bay where I work. He is, and always will be, the light of my life. From the bottom of my heart, I thank both Terri and Tamara (and all of the Dumont family) whose pure dedication and love helped raise such a wonderful puppy. I look forward to sending photos and updates of "Caelan's" adventures. I know when it's time to add another beautiful Aussie into my heart I will certainly go back to Criteria, where they are very professional and down-to-earth. All in all, it has been a fantastic experience!" This is a Syd daughter "Bella" and her human Emily. They are excelling in Rally, obedience and i've heard that Bella is a natural with the sheep. Keep up the good work girls! Watch for this dynamic duo in the Northwest. Mick and Mowgli are owned and loved by the Kent family in Pleasant Hills California. Mick is from out Frankie x Syd litter and Mowgli if from our Lennie x Taos litter. Thank you Nonie for being such a wonderful mother to these two great boys. I know you'll have your hands full but will have plenty of love to give along the way as well as a lifetime of enjoyment. My name is Terry. One day I asked my husband if I could have a dog. With my son at school and now working, also with my husband at work I felt I wanted a companion. I knew people in the neighborhood with small dogs, aka Carpet dogs, and my music teacher also had a small mixed dog. So I thought it would be nice to have one of these Carpet dogs. My husband said no! He told me I needed a real dog. After many hours of doing research on the internet for medium sized dogs (also owning an Aussie mix several years ago), he decided that's what we should get. So he came across Terri's website and she had just had a litter of pups. We gave Terri a call and went to visit her a few days later - JUST to look. John said to me" Don't fall in love with the first puppy you see". Well, guess who fell in love with the first puppy he saw - John! 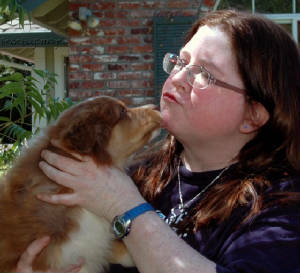 After meeting Terri and her puppies, there was something special about them. We went over again the following week and put a deposit on a black tri female. 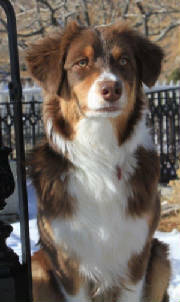 The personalities and temperments are wonderful on all of Terris dogs, from the adults to the pups. For our first time buying from a breeder, it was wonderful. We went over every weekend to see Kelli. Even one time we couldn't make it on a weekend and Terri was very gracieous about having us over after she came home from work. Kelli is now seven months old and we are the best of friends. I take her almost everwhere with me and am very impressed on how smart she is and her willingness to learn and please us. John and Kelli will be doing Agiltiy in the near future. I do want to thank Terri for her friendship and kindness to my family. 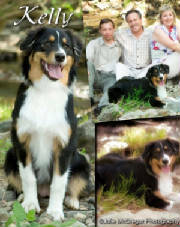 "Lola is the little girl who completed our two Aussie family. 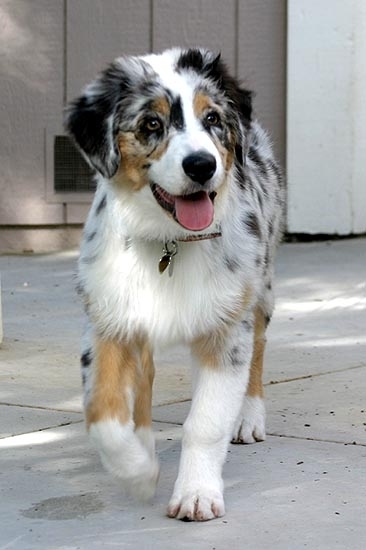 We thank God everyday that Terri returned our email to tell us she had a blue merle female available. 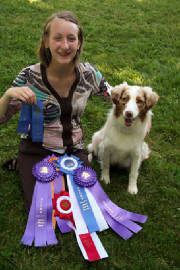 Terri has kept in touch with us, which was something we were looking for in a breeder. We had a great buying experience and would recommend Criteria Aussie to anyone who asks. Caty even took Lola for a walk around the ring at a show in Dixon." Thank you again Terri for bringing Lola into our lives." Mary, Dave, Megan, Rick and of course "Big Nick"
Jammies x Quincy puppies with "Visitors"
When Tamara called me inquiring about a puppy she was insistent that I know up front that she had 6 children under the age of 10. She said that several breeders that she had spoken to previously wouldn't sell her a dog because of the quantity of kids and she would understand if I felt the same way. At first I was puzzled by the comment as I have always felt Aussies to be excellent family companions and adaptable to almost all situations. 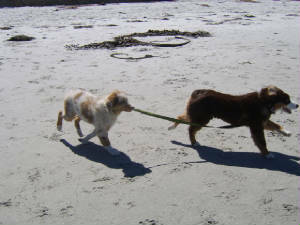 And then I was annoyed that a breeder would assume that an aussies would be "out of place" in a home with 6 kids.